So we took the kids to the local zoo, as you can imagine it was quite a learning experience. My kids favorite area was the reptile exhibit. I think that these animals seem more of a mystery so that makes them more interesting. I, for one, am not found of the slithering, icky things, but the kids felt differently. My daughter seemed very taken with the Boa Constrictors. She has since been making them out of paper gluing the pieces together trying to make a super long snake LOL. I thought that it was interesting that they give live birth and that, even though they can reach 13 feet, their life span is unknown. They are found from Mexico through South America and the Lesser Antilles (islands off the coast of South America). They live mostly in the rainforest, but they can be found on grasslands, farms and on rocky hillsides. They can be from 3 - 20 feet long and reach 100 pounds, though most are smaller. They are colored in patterns of brown, gray and tan that look like fallen leaves. This helps them blend in (camouflage). They can use their tails to grip branches. This is called a prehensile tail. They have no fangs or venom. They start out eating mice, birds, lizards, and frogs. As they get bigger, they begin to eat bigger prey like; monkeys, capybaras, agoutis, caimans, and wild pigs. The boa waits for prey to come to the river to drink. 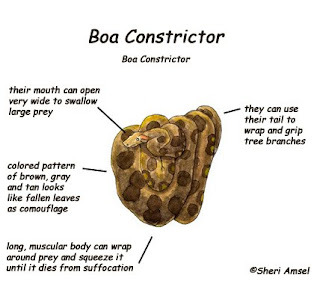 The boa constrictor kills it by squeezing it to death (constriction). It coils its body around it, and each time the prey breathes out, the boa squeezes tighter and tighter. Soon its prey can’t take a breath at all and dies. The boa swallows them whole. Since the boa is cold-blooded and moves so slowly, it does not need a lot of food. After eating large prey, they may not eat again for a long time. Man is the adult boa constrictor's only enemy. Young boas are eaten by coatis, hawks, caimans, and wild pigs. They have up to 60 live babies. The females keep the eggs inside her until they hatch at birth (This is called ovo-viviparous). She doesn’t eat while she is carrying the eggs.